HMB now in convenient tablet form. HMB (β- hydroxy β- methyl butyric acid) is a substance produced in the body during the metabolism of the branched-chain amino acid leucine. In the United States, it has been used as a supplement for power athletes for over 10 years. It has recently become available as a supplement in Japan. 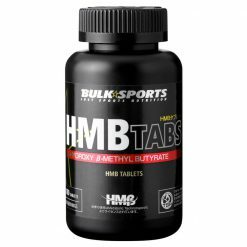 HMB tabs are a supplement that is a favorite of athletes with bodybuilding goals. It prevents protein degradation during exercise and promotes muscle recovery. Since scientific evidence shows that it acts synergistically with creatine, it is recommended for power athletes. Bulk Sports HMB tabs use HMBeta raw materials licensed by Metabolic Technologies Corporation. The raw material is the same material that was used in a number of HMB studies examining the effects of this supplement on sport and exercise performance. 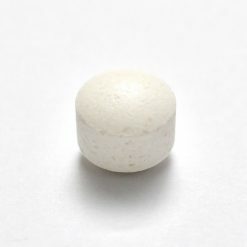 HMB tabs are in easily ingested tablet form, which is very useful because it can be taken without having to worry about the hassle and taste of powder. Take 2 tablets per serving with water or the beverage of your choice, 2-3 times daily.